The evidence for evolution - What do homologous similarities tell us? Tetrapods are the group of vertebrates with four legs. They occupy a wide variety of environments, and use their limbs for many differing functions. There is no clear functional or environmental reason why all of them should need a five digit, rather than a three or seven digit limb. And yet all modern tetrapods do. "What could be more curious than that the hand of man formed for grasping, that of a mole, for digging, the leg of a horse, the paddle of a porpoise and the wing of a bat, should all be constructed on the same pattern and should include similar bones and in the same relative positions?" The pentadactyl limb is a homology in the pre-Darwinian sense: it is a similarity between species that is not functionally necessary. Pre-Darwinian morphologists thought that homologies indicate a 'plan of nature', in some more or less mystical sense; for evolutionary biologists, they are evidence of common ancestry. An animation gives you a good idea of the homologous structure between different species. Figure: all tetrapods have a basic pentadactyl (five-digit) limb structure. 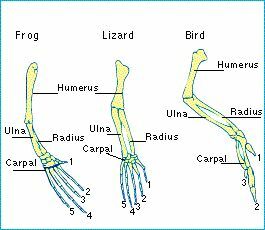 The forelimbs of a frog, lizard and bird are all constructed from the same bones even though they perform different functions.